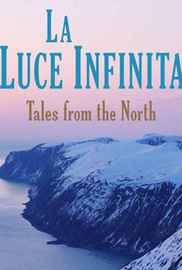 "La Luce Infinita - Tales from the North" - Arianna Tricomi went on a journey to the High North of Norway. She invited her best ski buddies to celebrate spring shredding, a World Title and the end of an amazing ski season. The action took place in Finnmark´s coast mountains around the beautiful little fisher town of Bergsfjord, where the daylight is infinite and the ocean is surrounding every peak. The film tells us about a trip to the North where a bunch of individuals who are in love with skiing come together to shred 24/7. Every character is described from a outside voice that gives us a glimpse of their inside worlds. All beautifully embedded in a custom made soundtrack, which caries you and the riders through the epic landscapes of Norways far north.